Egyptian actress، Ghada Adel posted on her official “Instagram” account the official promo of her son Boody’s first film “Al freet”. “Sultan Al Tarab"، George Wassouf received Lebanese composer، pianist، playwright، and political commentator، Ziad Rahbani in his home. George shared with his fans on his official “Instagram” account a video from the meeting، which showed Wassouf listening to a musical piece composed by Rahbani. Tamer Hosny praises news application "Zajel"
Egyptian superstar، Tamer Hosny praised on his official “Instagram” account news application "Zajel"، congratulating the application creators. Tamer posted on his official “Instagram” account application’s picture via “Instagram stories” feature، and said: "Zajel application is a great idea". The app had launched in the last period and gained the admiration of several public figures، as well as a large number of users. Emirati superstar، Hussain Al Jassmi posted on his official social media accounts the promo of his latest song “Ma Nsitak” (Did not forget you). Jordanian singer، Diana Karazon posted on her official social media accounts her latest photo session. Diana Karazon looked stunning in a black formal dress with a simple make-up and hairstyle، which gained the admiration of her fans across the social network. Egyptian singer-actress، Sandy posted on her official “Instagram” account the poster of her new film “Eish Hayatk” (Live your life)، revealing the film’s premiere date، which is set to hit the cinemas on Valentine day، which falls on February 14. Ashton Kutcher Tweets Out His Number، Asks Fans to Text Him! Have you ever wanted to text with a celebrity? Well here’s your chance to have a texting relationship with Ashton Kutcher! 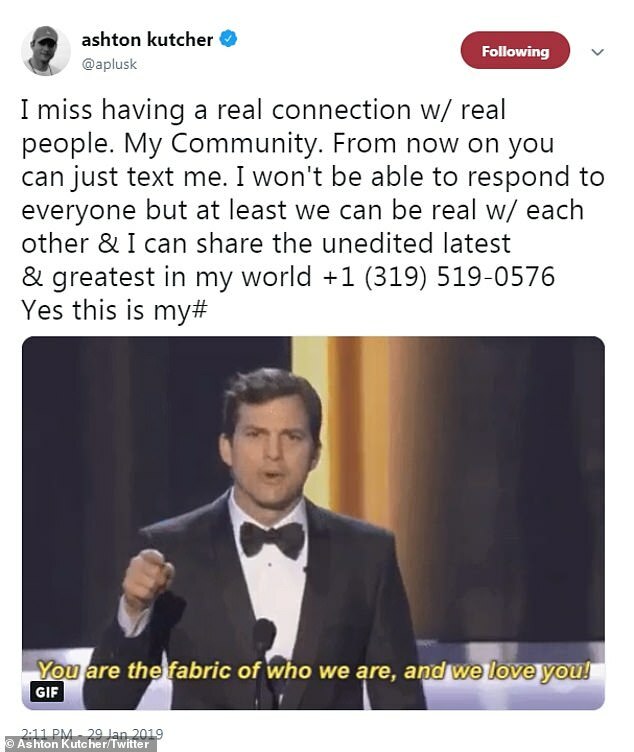 The 40-year-old actor has tweeted out his phone number and he’s encouraging fans to text him so that they can form a “real connection.” Chances of him replying are probably slim due to the amount of people who are likely reaching out، but you never know! John Legend Is Learning How to Swim at Age 40! John Legend is opening up about learning how to swim as a 40-year-old! The singer says he last took a swim lesson when he was five, but he’s getting back in the pool. Chicago West’s first birthday party was truly a trip down the rabbit hole! On Tuesday، Kim Kardashian West decided to share some new، sweet images from her youngest daughter’s party including photos of the birthday girl rocking a colorful balloon crown and her sister، North، romping in a white dress and Doc Martens. As fans now know، the theme for the Jan. 15 shindig was both a nod to a Disney classic while also delightfully pun-y، making for some dazzling decorations.